We no longer set up Classic Shell as the default user environment on Windows 10 (due to freezing sessions that we discovered after rollout). If you are a user with an old Classic Shell setup (or decided to experiment with it), this is how you can disable it. Right click on the Start Menu Icon. 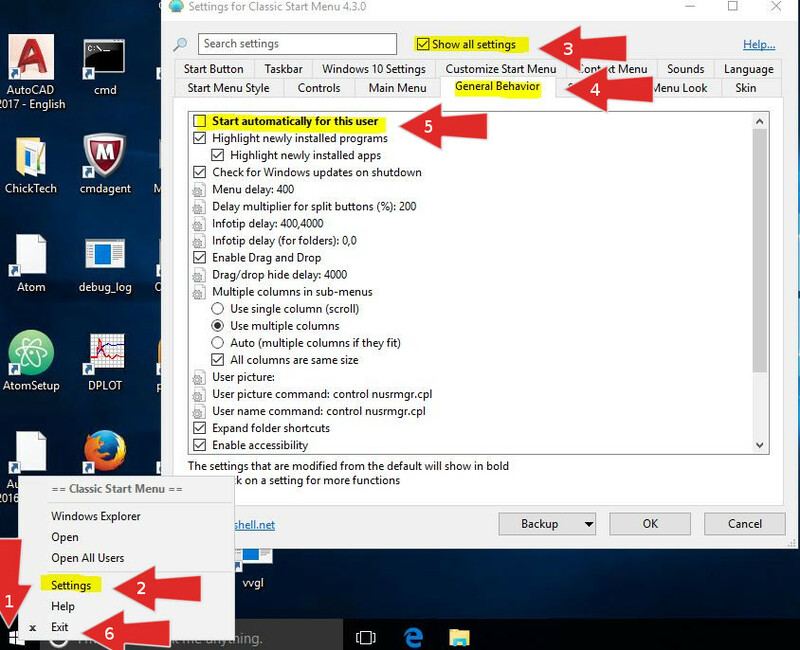 Check Show all settings on the classic shell settings window. Click on the General behavior tab. Finally to close Classic shell now, right click on the Start Menu Icon and click Exit. After Classic Shell is closed, the Windows Start Menu may be slow to respond or unpopulated with many items. This is one of the reasons we installed Classic Shell, but it should be temporary after a couple logins. As always, contact The CAT if you experience additional issues, or have questions.